Model:ASG STI Duty One 1911 Non Blowback. Materials: Metal slide and polymer frame. Action: Semi auto blowback, single action. Ammunition Capacity: 20 round magazine. Trigger Pull: The trigger pull on the ASG STI Duty One 1911 Non Blowback is fairly light in both single and double action. Take-up is the same in both modes but when in single action mode most of the trigger pull has little to no resistance until you get to the break point near the end where the hammer is released. Accuracy: In an Earlier review I shot the Blowback version STI Duty One 1911 air gun at a target from 20 feet away in a free standing position, and it performed well getting a 1.5 to 2 inch grouping right in the center of the target. The rear sight is adjustable for windage which is always nice to have just in case you are shooting a bit to the left or right. For me there was no need to adjust the sights. My Chrony testing with an eight shot averaged result was 373 fps - very decent for a blowback pistol! It will be interesting to see how this Non Blowback version performs since there is more CO2 going to the BB and less gun movement without the Blowback operation. 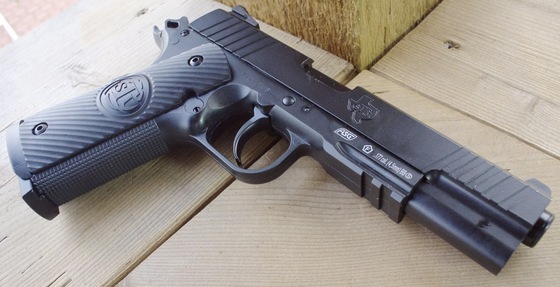 Build Quality: ASG did a great job designing and making the STI Duty One 1911 Non Blowback BB gun, they didn't really compromise on anything other than going with a polymer frame! With that said all that important parts like the Slide, Slide Catch, Safety, Mag Release, Hammer, Barrel and Magazine are all metal. The fit and finish as with all the ASG air guns is very good! Realism: The ASG STI Duty One 1911 Non Blowback version is a close replica to the real steel STI 1911, the only real giveaway is the trigger design, as a true 1911 trigger is not your typical lever type. Even with the different type of trigger the STI Duty One is a very good replica complete with STI licensing and trademarks. No Blowback action but does have a working slide and slide catch. Shoots in both single and double action. Good quality control, very well made, fit and finish is good. Should have good power and accuracy like the blowback version, perhaps even a bit better. May have even better CO2 usage than the already good blowback version. Holds really well in the hand. Trigger is not true to the real steel 1911. No working grip safety like a real 1911. Polymer frame rather than a metal frame. CO2 can be hard to get out.